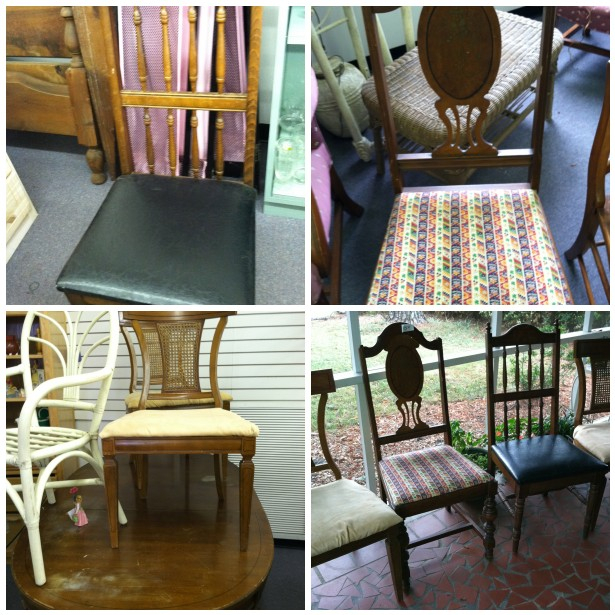 But, on a recent trip to a thrift store, I decided to embrace the hodge-podge dining room look and buy 4 wooden chairs to paint and recover. After all, I like to think I’m a little bit crafty, and I figured it would be a fun weekend project. 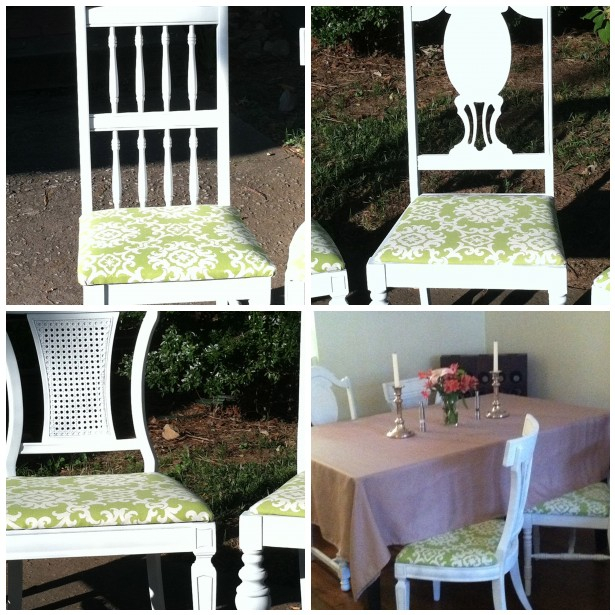 My thought was that 4 different wooden chairs, all painted the same color and recovered in the same fabric, could look like a cute little hodge-podgey set. And it’d be much, much more affordable. 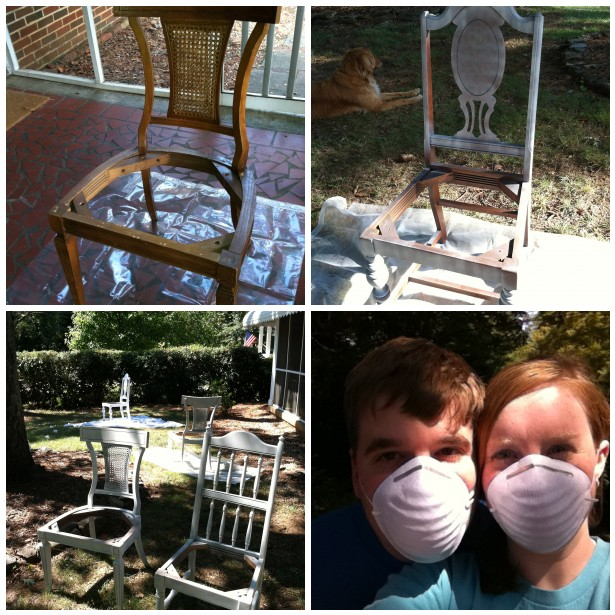 and a few pictures of the process: we sanded them, primed them, painted them, and recovered them over the course of 2 days. some of these pictures are cropped, but you get the idea. We are really happy with the new look of our dining area… and excited about our thrifty, crafty adventure. It was HARD work, but totally worth it. Hope you enjoyed your weekend, too! We’ll post more food/recipes soon! My mom is a much better blog-reader than I am. She told me about this post tonight and I must say I am truly inspired!! You guys are amazing! we’re actually getting ready to do the same thing! mom and dad had an old set of cherry dining chairs. 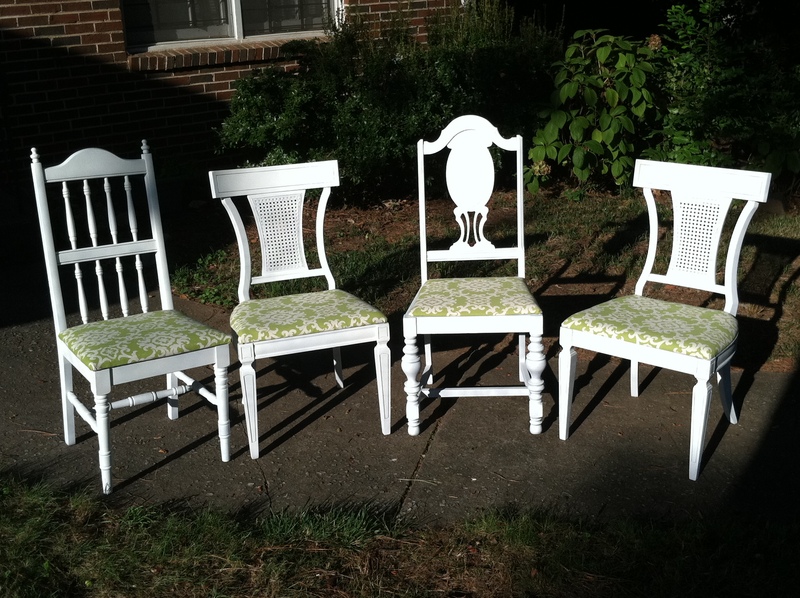 they’re all the same, but i’m going to paint them the same color and recover the seats in coordinating fabrics…i’m so excited to work on mine after seeing how great yours look!! Wow! So beautiful! I love them and love you guys. I’m so proud of you!!!! I love projects like that. Im sure Peggy is very impressed. You got her genes in crafting. Actually, the above was not just from Ron, but both of us. The chairs are awesome! Your touch is always so special. 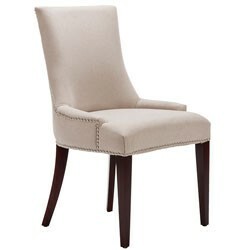 Sitting around your table has always been as good as it gets and now the food AND the furniture are off the charts!!! The chairs look great! Good job! You do have some good crafting genes in you!